It's been over 25 years of me walking the beaches of Southwest Florida, but it's not to get a tan...it's to go fishing. I've fished the beaches for Snook, Spotted Seatrout, Flounder and Pompano over the years. Snook are my favorite: they can grow to be over 20lbs. and they pull hard, making tremendous runs. Watching a Snook - sometimes over 35" in length - open her mouth and inhale your offering in 2 feet of water or less is the ultimate thrill. This is hair standing up on the back of your neck kind of fun! A key to fishing the beach is a high quality pair of polarized sunglasses. You can't effectively catch what you can't see! The first Snook tournament I fished was "Fishing for Snook" off the beach at Honeymoon Island State Recreation Area near Dunedin, Florida in 1999. The following year, I was the Grand Prize winner out of well over 200 other anglers, winning my first fishing kayak thanks to a 36" Snook. During the early Spring to late Fall, the common Snook, also known as the Sergeant fish or Robalo, can be caught along our Southwest Florida beaches by sight fishing in the calm surf. You can fish for Snook all year long, but I don't usually fish for them during our winter months when it's colder out because it puts too much stress on the fish. Beach Snook are fun because you can see them in the surf. This style of fishing combines a walk and stalk type of fishing since you're walking along the beach in search of fish. Bright, sunny days when the sun is high enough in the eastern sky to cast enough light into the surf are some of the best times to sight fish. During the summer, this usually occurs around 8:30 in the morning. 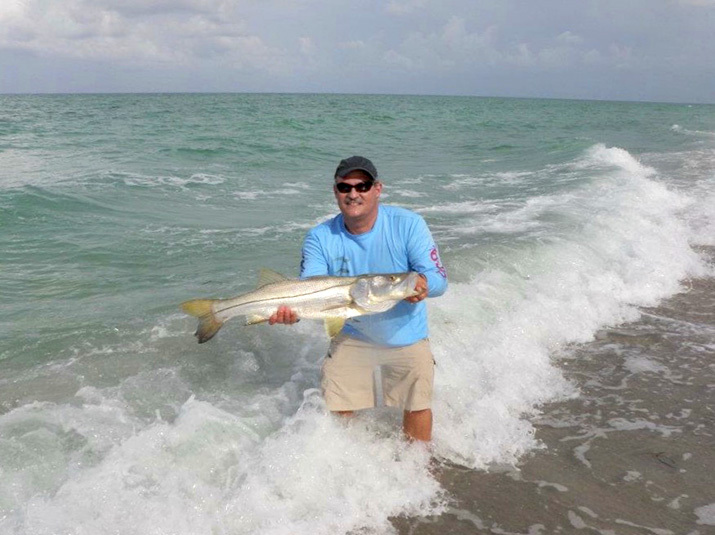 A surf temperature of approximately 75 degrees and above is ideal for Snook fishing, as these conditions are needed for the Snook to become active and feed comfortably. Snook will stay along the beaches and passes usually until early November and then head offshore or up the coastal rivers and estuaries for the winter. I love catching the big female Snook as they are over the harvestable slot limit of 28-33" on the West Coast of Florida. You can fish for them during the closed season but special care, heavier tackle and barbless hooks are recommended. I'm wearing AFTCO shirt and shorts I purchased at our store with the long nosed Cuda pliers in my pocket! Awesome products and field tested by me. I also purchased the Columbia long billed tactical hat at the store that I'm wearing so I'm truly decked out with West Marine purchased gear. Turtle Beach in Sarasota and the beaches in southern Sarasota County like Caspersen's are great for beach fishing. There are several beaches on Manasota Key near Englewood that are very good as well. The beaches on Gasparilla Island near Boca Grande are excellent for sightfishing or using big, live bait. 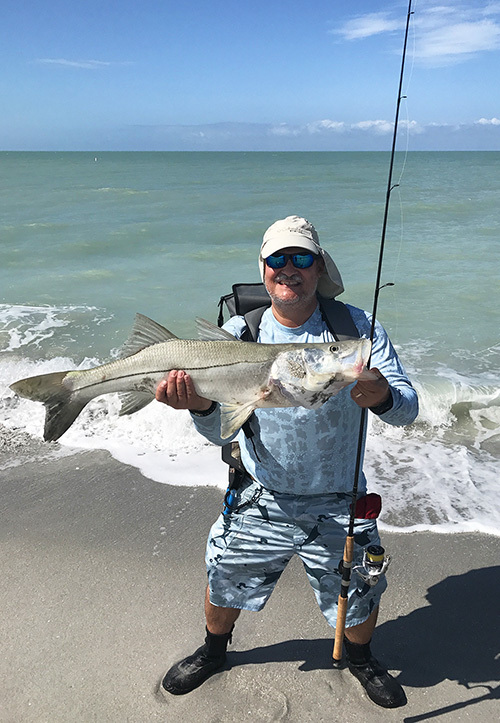 Bowman's Beach on Sanibel and Turner Beach on Captiva Island are also Snook fishing hotspots during the summer months and are noted for being hotspots for fly fishing beach Snook. A key to fishing the beach is a high quality pair of polarized sunglasses. You can't effectively catch what you can't see! The lenses can be glass or a high quality plastic but they should be amber based to allow contrast in shallow water which will allow you to spot fish or their fins and tails. The quality glass or plastic should block out all or most of the damaging UVA/UVB/UVC rays your eyes are exposed to. I have prescription sunglasses and can see 20/15 after all my years fishing. I attribute my great vision and healthy eyes to wearing high quality sunglasses. Spend the money because you only have one set of eyes. You need to protect them from the harmful rays of the sun. I tell that to my customers a lot. You should also be sure to wear Sunscreen rated SPF 15 and above as well as SPF rated clothing and a wide brimmed hat. Long sleved fishing style technical shirts, shorts or long pants with breathable quick drying fabric are preferred for comfort during our hot and humid summer months. No trip on the water is complete without having your safety gear on or with you. I also carry a flare kit, first aid kit, VHF radio, and cell phone while on the water as well as some food and plenty of water or sports drinks in insulated bottles to help stay properly hydrated. West Marine has a great selection of clothing, fishing tackle, sunglasses and other accessories for all your fishing and on-the-water activities. I use artificial lures and flies because they are easier to carry and I enjoy watching a fish attack a lure or fly in shallow water as I impart the action to get a strike. I use artificial lures and flies because they are easier to carry and I enjoy watching a fish attack a lure or fly in shallow water as I impart the action to get a strike. In my opinion, it's also a greater sense of accomplishment to get a fish to eat an artificial lure or fly compared to live bait. A medium to medium heavy 7' foot rod matched to a 3000 or 4000 spinning reel is ideal for Snook beach fishing, as is a 9' fly rod in an 8 weight. 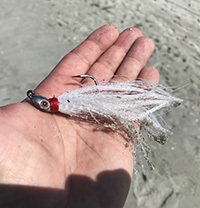 Soft plastics, Topwater, and suspending baits along with small white flies that mimic that natural forage found along the beach are optimal. Since Snook do not hang near the surface of the water, it helps to be able to distinguish where the fish is along the bottom. If you can spot them around structures, rocks and sticks in the water, it will allow you to make a proper presentation of the lure or fly. By swimming it away from the fish or hoping it along the bottom at an angle away from a swimming or suspended fish, you can present the lure as if its live bait. The challenge for me is being able to fool a big fish into taking my offering by making a presentation where the lure is appetizing and eaten. If I succeed, a battle ensues with the line screaming, runs and head shakes as the fish tries to elude the catch. I also practice proper catch and release techniques and won't take a photo of a fish without planning it out first. A fish is way too valuable for me to catch only once and the harvest slot in the state of Florida for SW Florida is one Snook per angler per day during the open season at a 28" to 33" total length. I also record my Snook catches for the Florida Fish and Wildlife Commission (FWC) for scientific research and submit any Snook carcasses I have for research as well. Scientists can determine from the otolith bone, found inside the Snook's ear, how old the fish is by slicing it crosswise and counting the rings during post mortem experiments. I got into kayak fishing in 2000 by winning my first kayak as the grand prize winner with a 36 inch snook in a beach fishing styled tournament! I always wear my West Marine life jacket when on the water. While these tips and tricks can help with Snook fishing anywhere, they are intended for angling in the Gulf where the open seasons are usually from February to May and September to December. 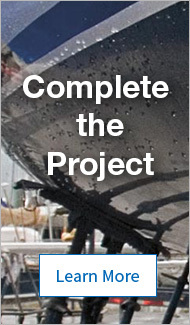 For specific dates and more information about the species and regulations in your area, visit the Florida Fish and Wildlife Conservation Commission (FWC). Ken Taylor is a former International Game Fish Association (IGFA) line class record holder for Snook. He is also a Member of the IGFA 25lb. Snook Club as well as a Member of Club 40 for the Snook Foundation by catching and releasing a Snook of more than 40" in length. 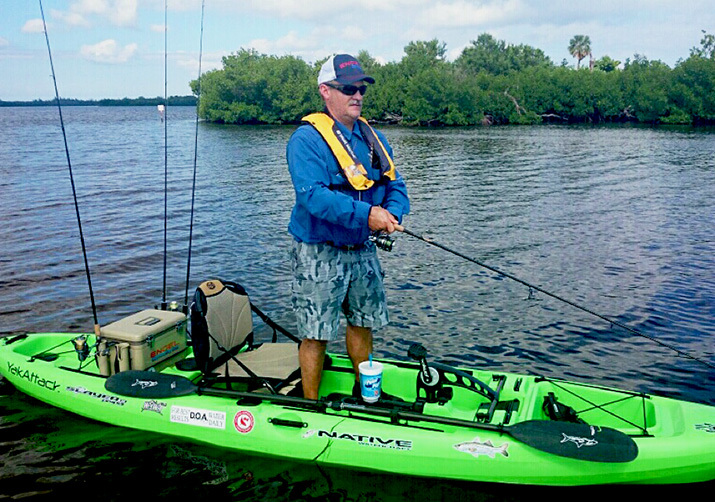 Ken is West Marine's Paddlesports Specialist and Pro-Staff Angler Member for the Fort Myers Flagship Store. He also dons the title of Pro-Staff Member for Native Watercraft, DOA Lures Kayak, and a Brand Ambassador for Sunsect. He has been beach Snook fishing for over 28 years and when he isn't on the beach hunting for a catch, you can find him fishing from his Native Watercraft Slayer 13 Propel Kayak!